The sad thing here is not Mother Teresa’s darkness, or dryness, or loneliness, or even torture, terms she herself used, but rather the fact that she never found how to accept this emptiness or see it as a blessing or at least an indispensable phase. Instead, she remained stuck in denial, imagining a convoluted scheme where some friend praying for her would would help her let God have free hand—as if it was not precisely His free hand that had her where she was in the first place. 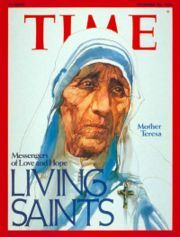 Almost as startling is the ludicrous assertion by one theologian that “Come Be My Light,” the new book in which Mother Teresa’s letters were published, will “eventually rank with St. Augustine’s Confessions… as an autobiography of spiritual ascent.” How one could view Mother’s vast, empty, arid mental vistas, and her unyielding refusal to accept them, as “spiritual ascent” simply boggles the mind. Other theologians are even more divorced from reality, spinning ridiculous stories about how Christ’s absence in Mother Teresa’s life was “part of the divine gift”. She was no more exempt from the realization that religion is a human fabrication than any other person. As in his book, he throws out the spiritual baby with the religious bathwater, failing to understand the crucial difference between a simple lack of belief and the experience of emptiness. When in Kolkata several years ago, I visited Mother Teresa’s tomb. Standing before it, I sensed at least a bit of her spiritual void. People today are so starved for goodness, or the appearance thereof, that we not only award Nobel Prizes to people that set up facilities to take care of a few dying people, but then once they themselves die move to bestow on them religion’s highest posthumous honor of sainthood. This entry was posted on Thursday, May 3rd, 2007 at 08:46	and is filed under religion. You can follow any responses to this entry through the RSS 2.0 feed. You can skip to the end and leave a response. Pinging is currently not allowed. Quotes from the New King James Holy Bible. Romans 11:5 “Even so then, at this present time there is a remnant according to the election of grace. 6And if by grace,then it is no longer of works; otherwise grace is no longer grace. But if it is of works, it is no longer grace; otherwise work is no longer work. I think Mother Teresa’s words, though interpreted as manifestations of spiritual desolation, simply indicate her being human. Every one of us, at some point, feels detached from what our faith promises. We are humans.